For almost 20 years, Superflight's AerobieR brand of high performance sport toys has been bringing joy to the young and the young at heart. Patented designs and features make these unique products a popular choice with both consumers and retailers. Merchants recognize the exceptional play value found in Aerobie sport toys and are proud to offer them to their customers. 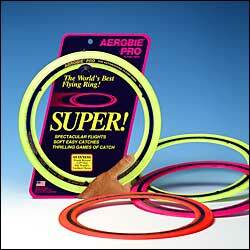 Aerobie products have been singled out for numerous design and performance awards throughout the years. Most notably, the Aerobie Pro flying ring holds the Guinness World Record for the farthest thrown object - an incredible 1257 feet! 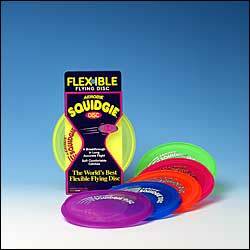 Other Aerobie products - like the SquidgieR flying disc, the Rocket football, the AeroSpinTM yo-yo, the SuperdiscTM flying disc and the Squidgie ball - have been recognized for their breakthrough designs and category leadership as well. Superflight manufactures almost all Aerobie brand products in the USA, so we are always in stock and ready to ship within days of receiving your order. Isn't it time to see what Aerobie's reputation for excellence, award winning product line, and personalized customer service can do for you and your business? For more information on Superflight and the Aerobie line of sport toys, go to http://www.aerobie.com or contact us at aerobie@aerobie.com.